Moreton Island is known for nature, outdoors, adventure, and historic sites. Your plan includes some of its best attractions: head off the coast to Moreton Island, make a trip to Tangalooma Wrecks, get outside with Tangalooma Island Resort Dolphin Feeding, and enjoy the sea views from Cape Moreton Lighthouse. To see other places to visit, more things to do, and tourist information, read our Moreton Island trip planning app . London, UK to Moreton Island is an approximately 30-hour flight. The time zone difference when traveling from London to Moreton Island is 10 hours. In January, Moreton Island is much hotter than London - with highs of 33°C and lows of 24°C. You will leave for North Stradbroke Island on the 11th (Fri). Spend the 14th (Mon) exploring nature at Blue Lake National Park. You can plan North Stradbroke Island trip in no time by asking Inspirock to help create your itinerary. Getting from Moreton Island to North Stradbroke Island by car takes about 6 hours. In January in North Stradbroke Island, expect temperatures between 33°C during the day and 24°C at night. Wrap up your sightseeing on the 14th (Mon) to allow time to travel to Canungra. Canungra is a small rural town and locality in the Scenic Rim Region local government area of South East Queensland, Australia. Explore the numerous day-trip ideas around Canungra: Gold Coast Hinterland Great Walk (in Lamington National Park) and Darlington Park (in Darlington). There's lots more to do: Head underground at Glow Worm Caves, get engrossed in the history at Tamborine Mountain Heritage Centre, stroll through Witches Falls Walking Trail, and look for all kinds of wild species at Thunderbird Park. For ratings, maps, photos, and other tourist information, you can read our Canungra online route builder . Traveling by car from North Stradbroke Island to Canungra takes 3.5 hours. Expect a daytime high around 32°C in January, and nighttime lows around 24°C. Wrap up your sightseeing on the 18th (Fri) early enough to travel to Ipswich. Ipswich is an urban region in south-east Queensland, Australia, which is located in the south-west of the Brisbane metropolitan area. Ipswich is known for parks, museums, nature, childrens museums, and nightlife. Your plan includes some of its best attractions: explore and take pictures at Queensland Raceways, explore the world behind art at Ipswich Art Gallery, look for gifts at Gators Aquariums, and try out the rides at River Heart Parklands. To find traveler tips, photos, ratings, and tourist information, go to the Ipswich trip itinerary planner . Drive from Canungra to Ipswich in 1.5 hours. While traveling from Canungra, expect a bit warmer days and about the same nights in Ipswich, ranging from highs of 36°C to lows of 22°C. Finish your sightseeing early on the 22nd (Tue) so you can travel to Brisbane. Change things up with a short trip to Bee Gees Way in Redcliffe (about 44 minutes away). The adventure continues: enjoy some diversion at South Bank Parklands, take in nature's colorful creations at City Botanic Gardens, identify plant and animal life at Lone Pine Koala Sanctuary, and explore the activities along The Brisbane River. 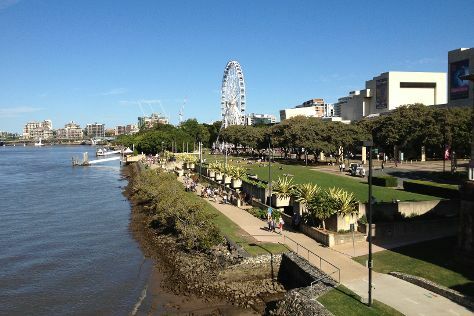 To see where to stay, reviews, more things to do, and tourist information, read Brisbane itinerary planner. Drive from Ipswich to Brisbane in an hour. In January, plan for daily highs up to 34°C, and evening lows to 25°C. Wrap up your sightseeing by early afternoon on the 30th (Wed) to allow enough time to travel back home.